Normally it's about a month between my Oakland Food News posts, but since my food news post yesterday I've found out about another bunch of new food and drink things happening in Oakland. Over on 14th Street is a new bar, Halftime Sports Bar. They've got hella TVs (folks were watching the A's when I looked in), a pool table, and a good beer selection. Their food menu is short, but does include some vegi options. A review on the Yelp page speaks highly of the roasted veggies side dish. They've been open less than two weeks. @dto510 pointed out this story on SF Eater about the Tribune Tavern, a new restaurant and bar which fittingly will be in the Tribune tower. It's a project of Chris Pastena, co-owner of Chop Bar. Oaklandish is working on their branding, so it promises to be stylish, too. They're aiming for a mid-March opening. @eatdrinkoakland tweeted that Oakland is in Bloomberg Businessweek's top 50 U.S. cities, in part because of the great restaurant scene here. Speaking of which, check out the Eat Drink Oakland website. 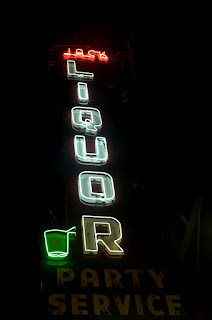 Paula Wirth has it filled with great food and drink photos from places around Oakland. And last night was the launch party for Farmigo in Oakland, but that deserves a post of its own. The upcoming event I'm most excited about is the 5 Historic Houses Bike Tour that I'm helping organize, but there are concerts, walking tours, and more coming up, too. And Tuesday night is the Taste of Temescal culinary crawl. Time again for some Oakland food news, with updates on recent openings, upcoming openings, and more. All the news that's fit to nom. First up, the Oakland Tribune reports that Borgo Italia in Old Oakland that I reported on last month is now open. I'm looking forward to trying it. Diablo Magazine reported that Somerset, a restaurant on College Ave. in Rockridge, closed suddenly in August. And they note the liquor license has been transferred to a new restaurant called Destino at 3909 Grand Avenue. That's the former location of Taste of Joy BBQ, and another restaurant (or two) before that. The same article also reports that the Trappist Provisions beer store/bar in the works by Chuck Stilphen from The Trappist (and ØL beer cafe and bottle shop in Walnut Creek) won't open before November. The space is near Wood Tavern, a ways up College from the former Somerset location. The windows were covered in paper when I went past today. And speaking of the former Somerset location on Collage, Inside Scoop SF reports that James Syhabout's next restaurant will be in the Somerset location. Syhabout is behind both Commis and Hawker Fare, two Oakland restaurants I haven't yet tried but have heard nothing but good things about. The above Dialog Magazine article also has updates on Forge, the pizza place planned for next to Bocanova in Jack London Square. Shoutout to @jameane of Oakland 411 for the info on these next two items. First, College Ave. is getting another noodle shop at 5812 across from Zachary's. Though I guess technically Noodle Theory is on Claremont, and it's known for soba noodles versus the ramen that this application specifies. @jameane also directed me to this news from sf.eater.com about Township, an "uber-locally sourced" restaurant moving into 1545 Broadway. Read more on the City Girl Farms / Township Kickstarter page. Speaking of College Ave., Diablo Magazine again has the story on the long-empty space at 5634, the former home of the Water Lounge. Rumor has it it will be French bistro-style, but a major renovation means it won't be ready any time soon. Luke Tsai at the East Bay Express reports on a novel idea from the 25th Street Collective: rent a food cart. The start up costs and permits needed can be fairly substantial, so this would be a way for more people to try the market. The idea is still in the planning stages. Shelly Butcher at Examiner.com reports a new Mexican restaurant called Nido is scheduled to open in Jack London Square sometime in October. The above article and GrubStreet SF both report that right next to it will be a PieTisserie pie window. Yum! Some updates on some of the new o-shaped foods in Oakland. SFoodie has more on Doughnut Dolly in the Temescal. They sound tasty, but sell out fast. More o-shaped food news, Inside Scoop SF has a report from opening day at Beauty's Bagels on Telegraph, which features Montreal-style bagels. Here's a fun video on Art Is In Coffee which was at Park(ing) Day. I rode past Commonwealth Cafe and Pub last week and heard they're aiming for an early October reopening after the fire several months ago. This nice story from Oakland North about Oakland businesses helping Commonwealth get back in on its feet confirms the early October timeline. Finally, there's a piece focusing on Arbor Cafe in Oakland Local, as part of their Small Business Month feature. While it's an OK sign during the day, it really shines (groan) at night. 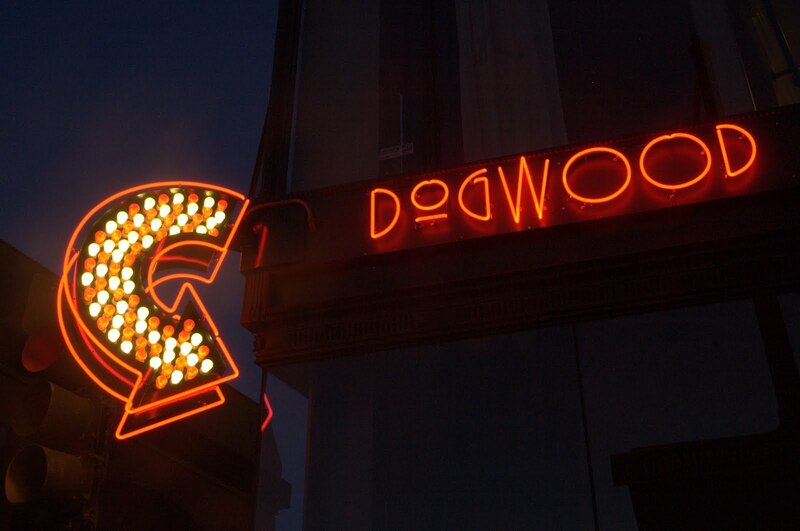 The bulbs on the arrow of the Dogwood sign are animated in a slow cycle. Yesterday I took a day off working and volunteered with Oakland-based GRID Alternatives. The core of GRID Alternatives is the Solar Affordable Housing Program, where they train and lead community volunteers (like me!) and job trainees from all walks of life to install solar electric systems with low-income homeowners. As part of their mission, they also install the solar panels on Habitat for Humanity houses, which is where my previous experience with GRID has been. This install was on an existing house, and the technology has changed a bit since I last volunteered (use of microinverters, for example), so I had some new things to learn. That's part of why I enjoy volunteering with GRID is the chance to learn new things. I worked on the ground crew in the morning, assembling pieces and passing things up to the roof. Then after lunch I worked on the roof for a while, helping run conduit from the main panel up to the start of the solar array. It was a fun day. Thanks to installation supervisor Dave Lee and the crew leaders for making things run smoothly and safely. If you're interested in volunteering with GRID, donating, or want to see if you qualify for an install, check the Grid Alternatives website. There's literally too much fun stuff to do this week in Oakland and not enough time to do it all. The event getting a lot of press is the Eat Real Festival at Jack London Square, but there are concerts, fundraisers, book events, walking tours, plus one of my favorite events, Park(ing) Day, which converts parking spaces around Oakland into parklets for pedestrians and cyclists to enjoy. 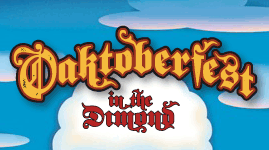 Oak Barrel Bash - Thursday, September 20, 6-8:30pm. Fundraiser for Rebuilding Together Oakland, with a raffle for great wine and other prizes. ($50-$70). Dixieland Jazz at Pardee Home - Sunday, September 23 from 1-4pm. The historic Pardee Home hosts the "Spirit of '29 Dixieland Jazz Band". ($20). Shoutout to Rebecca Saltzman for alerting me to this meetings. Sunday afternoon was a great jazz concert. 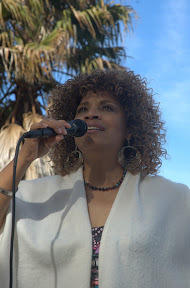 Clairdee wowed the crowd with her soulful and uplifting jazz. Sitting on the veranda of Camron-Stanford House overlooking Lake Merritt, sipping wine and munching food, we couldn't have asked for a lovelier setting. Note that Camron-Stanford House is also available for event rentals if there's a special event you need a special venue for. And don't forget: Camron-Stanford House will be the 3rd stop for the 5 Historic Houses Bike Tour on September 29th! Saturday was Creek to Bay Day, the Oakland part of the larger Coastal Cleanup Day across California. It happens as part of International Coastal Cleanup that has people volunteering all over the world. Last year I volunteered at Wood Park along part of Sausal Creek; this year I volunteered at Peralta Hacienda, along part of Peralta Creek. There was a big group of students from Fremont High School in Oakland, who mostly worked down by the creek, as well as a troop of girl scouts who cleaned up the playground area. The rest of us, a mixture of nearby neighbors and people like me who came from elsewhere in Oakland to volunteer, worked in the gardens and along the entrance walkway from Coolidge. I worked on picking up trash, and trimming around the interpretive signs in the garden. While some of signs were pretty grown over, it was easy, relaxing work. It was also a pretty short work day, from 9am until noon, so it made for an easy way to help cleanup Oakland and the bay. Trash that ends up near the creek frequently ends up in the creek, and then in the bay. Besides being unsightly, the garbage can injure or kill wildlife. It's a big, ongoing problem—last year's Coastal Cleanup Day picked up 1.3 million pounds of trash. Fortunately there were thousands of volunteers out around the bay and California working to clean up waterways and the coast again this year. Thanks to everyone who turned out! But you don't need to wait for a special day. Next time you're out walking along the shore, or just walking around Oakland, stop and pick up trash and throw it in a garbage can. Every piece you pick up is one piece that doesn't end up in a creek, the bay, or the ocean. It's an easy way to help make Oakland (and beyond) a little bit better. 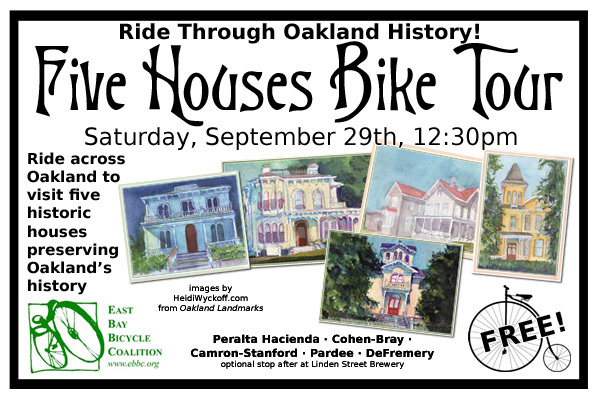 And just a reminder: the 5 Houses Bike Tour on Saturday, September 29th will begin at Peralta Hacienda. See http://5houses.ouroakland.net for more info. 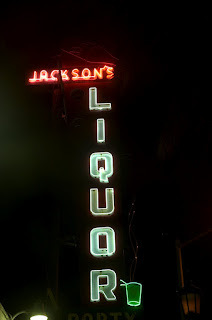 I've shot this great sign before during the day, but I got a chance to shoot it lit up last night. As an added bonus, Ramsey, one of the owners, came out while I was shooting and we talked about the past and future of the sign. He remembers seeing the sign as a child, when a friend of the family owned and ran the store. My guess is that it's from the 50s based on the design elements, but I'm not really sure. 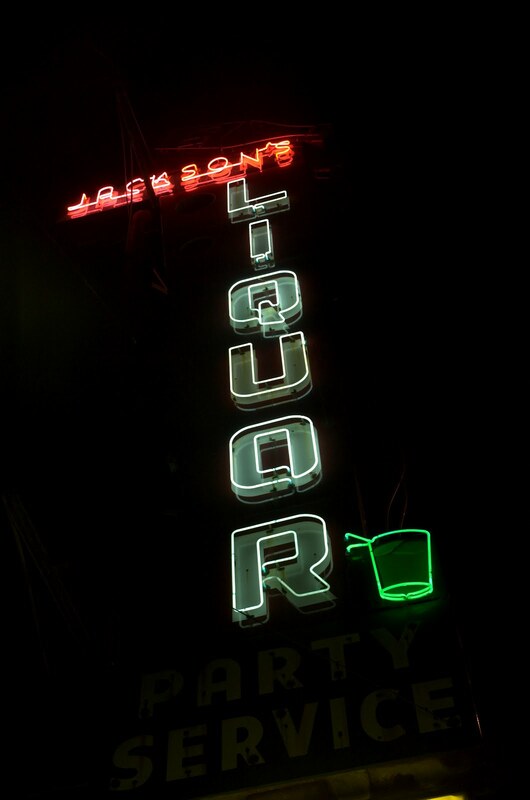 Ramsey paid to have the sign repaired a while back, but the company he hired hasn't finished the job. He pointed out where the "son's" on one side is by-passed with a patch wire, and we talked about how great it would be to have the swirling drink lights working again. I told him about NeonWorks and owner Jim Rizzo's passion for the work that I learned about at the OHA+Neon Works lecture back in January. And about how the owner of Pizzaiolo paid to have the G&G Hardware sign on Telegraph restored. 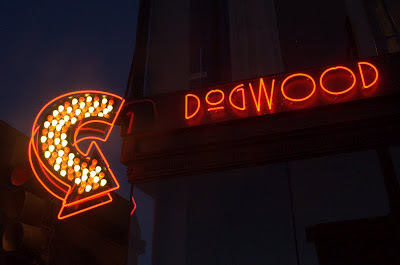 Whether it's the original company or NeonWorks, I hope the sign can be more fully restored. Lots to do in Oakland. 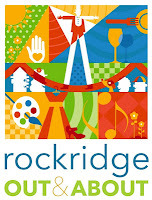 Some of the big things this weekend are volunteer opportunities, Creek to Bay Day and the 4th Annual Volunteer Fair. But there's a new art show, an art party, Bites off Broadway plus the usual host of regular events, and more. National Hispanic Heritage Month - Saturday, September 15, 2:30-5:30pm. 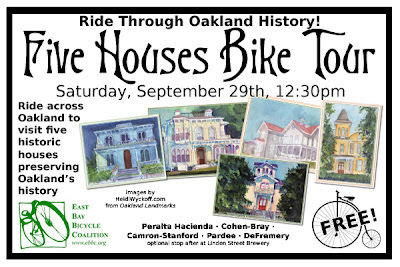 The Five Historic Houses Bike Tour will explore 5 homes that have preserved Oakland history, from East Oakland to West. 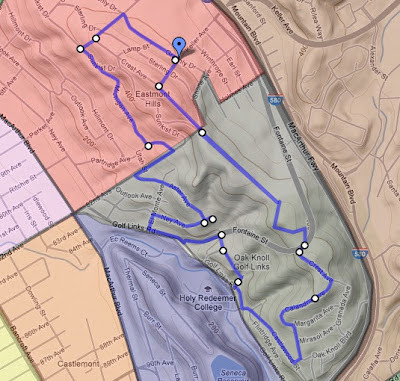 The ride begins at the Peralta Hacienda Historical Park in Fruitvale, then goes to Cohen-Bray House, Camron-Stanford House, the Pardee Home, and finishes at deFremery House in West Oakland. The ride is about 6 miles, and we'll stop at each house to learn about the history of the house and the people who lived there. We'll also see Preservation Park, a collection of historical homes in Oakland. Then join us for an optional stop at the Linden Street Brewery taproom, or head over to the 100th birthday celebration for the 16th Street Train Station, for food, fun and more Oakland history. If you're joining us from further afield, note that Peralta Hacienda is near Fruitvale BART and deFremery House is near West Oakland BART. As for any ride, helmets, water bottles, and comfortable cycling gear are recommended. Bring a lock for your bike and money for snacks along the way. View the approximate 5 Houses Tour route on Google Maps. The ride is free, and is sponsored by the East Bay Bike Coalition and the five houses. 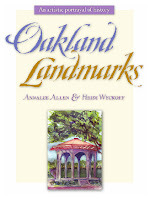 Special thanks to Heidi Wyckoff for the use of the paintings of the 5 houses from the Oakland Landmarks book. Need an easy to remember URL to let people know about the event? Use 5houses.ouroakland.net, which will lead people to this page. Questions? Email gene@ouroakland.net or call 510-394-2564. The bike tour was a big success! Read about it here. 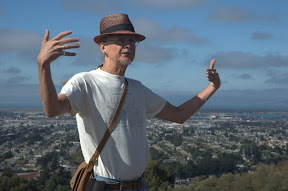 Saturday was another Oakland Urban Paths walk focused on geology. 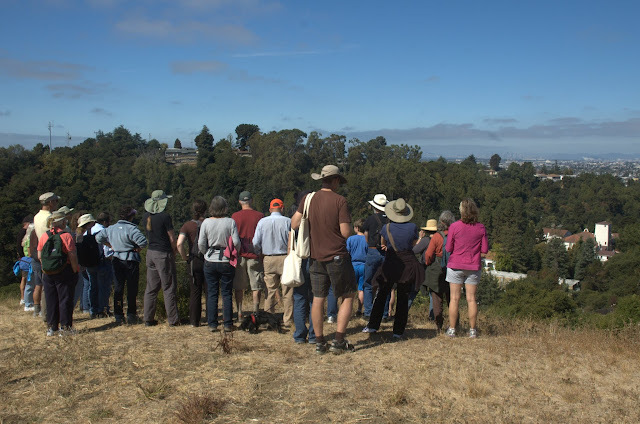 Led by geology writer Andrew Alden, we explored part of the Hayward Fault in Eastmont Hills and the King Estates Open Space. Thirty people and two dogs joined us for the short but vigorous walk which featured no stairs, only one improved walkway and lots of dirt paths. After climbing to the ridge, we walked into the nearby King Estates Open Space. The open space straddles the ridge, with views across I-580 to the hills and sweeping views out over the bay. Andrew pointed out the approximate path of the fault, and noted features that indicate its presence. For example, the smaller ridges towards the west appear somewhat truncated. That's because the land to the west is moving northward relative to the main ridge. The Hayward fault is a strike-slip fault, which means most of the movement is horizontal. The movement over time is relatively small, so there aren't dramatic effects like those that can be seen in Parkfield, California. But if you know what to look for, you can see possible evidence of the ground moving. Andrew adds: aseismic creep on the Hayward fault takes place at various rates between zero and 8-10 millimeters per year. Aseismic creep is measurable surface displacement along a fault in the absence of notable earthquakes, i.e., movement not from an earthquake. Less than 10 millimeters per year is a very small amount, but over a couple of years it is enough to crack pavement, twist doorways, etc. We walked down the hill and past Holy Redeemer College to some of the streets off of Golf Links Road. 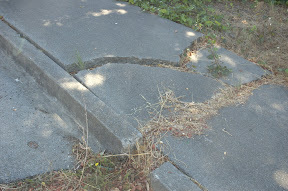 While the cracks in the sidewalks, driveways and streets might be just from the hill sliding, given the proximity to the fault it seems likely some of it is from the movement along the fault. I also wondered about the two now empty lots above Golf Links—simple landslide, or caused by the fault? Regardless, the fault does present a significant risk in the event of an earthquake. These days, anyone who buys a house near a known fault line in California has to sign a special form saying they acknowledge the risk. And everyone who lives in earthquake country should be prepared with an emergency kit and a plan. We walked along several streets and back up over the ridge to our starting point. Along the way I chatted with a number of neighbors who wondered what the group was. Everyone I talked with was pleased to have the group exploring their neighborhood, and I was happy to learn about a group of neighbors that had recently cleaned up the one paved walkway we encountered along with the rest of the neighborhood. Another fun, informative walk. Many thanks to Andrew for leading the walk and sharing his knowledge of geography. And thanks to everyone who joined us! Check out the USGS page on the Hayward Fault for some interesting maps. 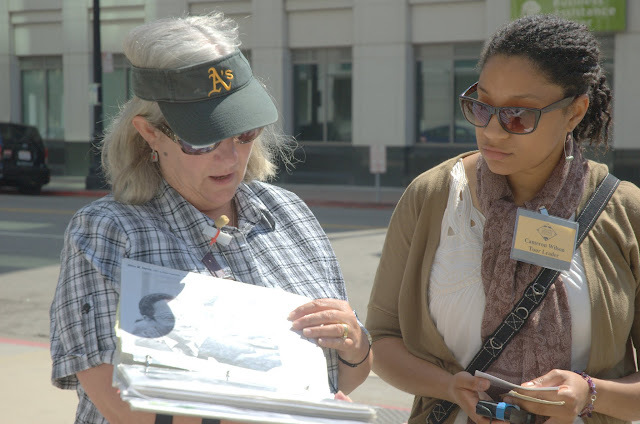 Back in August was an Oakland Heritage Alliance tour that may sound familiar to those of you who have been on the city walking tours in Downtown. It's no coincidence, because New Era, New Politics started out as an OHA tour but is now done most often as a city walking tour. The tour was led by Cameron Wilson and the city walking tours director Annalee Allen. I've been on the city walking tours version twice, once in 2011 and again back in February for Black History Month, so I was familiar with many of the people and places the tour covers, but I still learned some new things. Way too much fun stuff to do in Oakland. 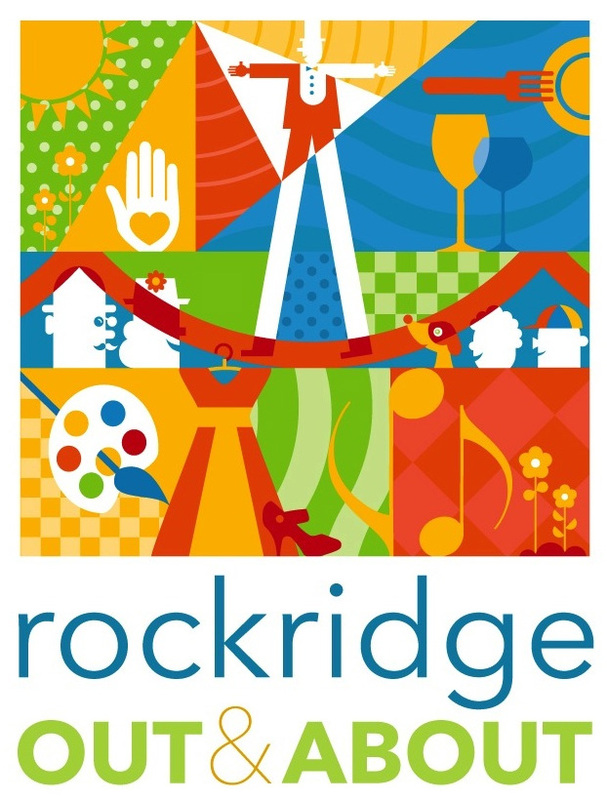 Friday is a First Friday with Art Murmur and all the associated events. It just keeps growing; according to the East Bay Express, the city will officially be closing some streets in Uptown for Art Murmur. PINCC Walk-a-thon - Saturday, September 8. Fourth annual walk-a-thon to raise money for Prevention International: No Cervical Cancer (PINCC). 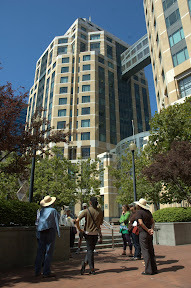 Read more at the Oakland Tribune. Endless Canvas: Special Delivery art show - Saturday, September 8. Come check out a 36,000 sq. ft., 3 story warehouse covered in art! With live music. 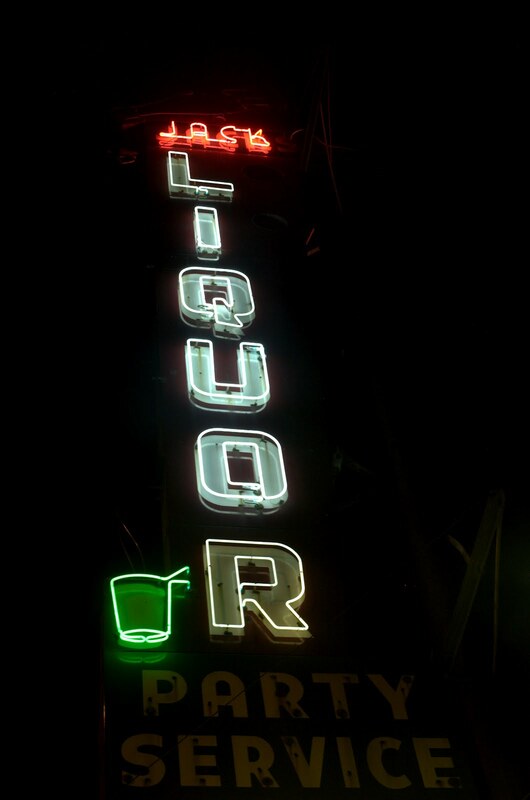 Anew sign, but a nice design and interesting because it uses green, which is a less common color for neon. This Pharmaca is on College Avenue next to the Trader Joe's, but there are other Pharmaca branches around the bay. They also have a nice open sign and window-mounted Rx sign. The Rx symbol is an abbreviation from the Latin "recipere", and means "take...". Or it's a form of the Eye of Horus, an Egyptian god, and which was worn on amulets to help ensure good health. Either way, the symbol has long been associated with prescriptions.